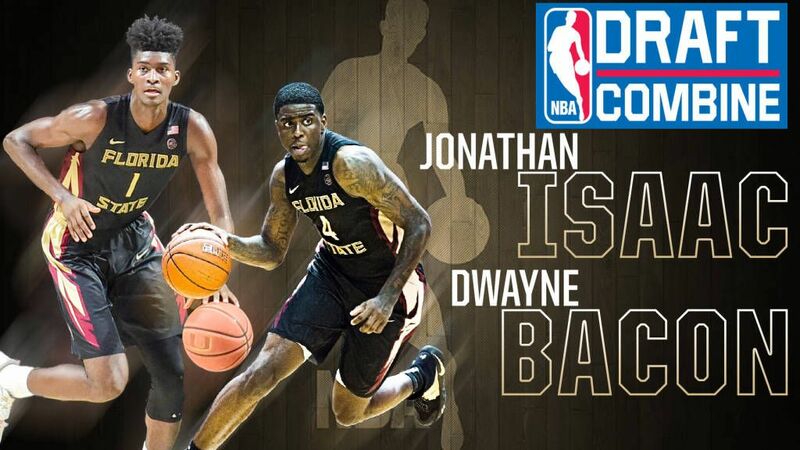 TALLAHASSEE, Fla. (seminoles.com) – Florida State stars Dwayne Bacon and Johnathan Isaac are two of approximately 60 collegiate players who have been invited to the NBA Draft Combine which will take place at the Quest Multisport Complex in Chicago May 9-14. The on-court elements of the event are scheduled for May 11-12. The NBA Draft Combine is a showcase for NBA coaches, general managers and scouts that takes place every May before the NBA Draft. The exclusive group of players, who receive invitations to the combine, participate in a number of activities designed to elevate their draft status. The players participate in interviews, undergo shooting drills, take medical tests, go through five-on-five drills and perform various athletic tests. Bacon and Isaac led Florida State to a 26-9 overall record and a 12-6 record in ACC play in 2017 as its top two leading scorers. The Seminoles finished the season ranked 16th nationally by the Associated press and 24th in the USA Today Coaches Poll. Florida State played in the NCAA Tournament and tied the school record for highest seed as the Seminoles played as a No. 3 Seed in the West Region. The Seminoles finished in second place in the ACC standings, were the No. 2 seed in the ACC Tournament and advanced to the semifinals of the ACC Tournament for the fourth time in school history. Bacon (Lakeland, Fla.) led the Seminoles with a career-best 17.2 points per game average while leading the Seminoles in field goals (221), 3-point field goals (57) and free throws (104) as a sophomore. He earned All-ACC Second-team honors, was named to the All-Tournament Team at the NIT Season Tip-Off Tournament, was named the Orange Bowl Classic MVP against Manhattan as he led the team with 16 points and 4 rebounds and scored in double figures in 35 consecutive games from February 17, 2016 through February 18, 2017. Isaac (Naples, Fla.) earned All-ACC Honorable Mention and All-ACC Freshman team honors in his only season at Florida State as he averaged 12.0 points and a team-leading 7.8 rebounds during the 2016-17 season. He was the crown jewel of Florida State’s 2016 recruiting class and lived up to all of the expectations placed upon him as a freshman. Isaac led the Seminoles with a 1.5 blocked shots per game average while making 31 3-point field goals (fourth) and shooting .780 from the free throw line (second). “I would like to thank God for being fortunate to be selected to participate in the NBA Combine and to once more have the opportunity to represent Florida State University,” said Isaac. Bacon played two seasons at Florida State while Isaac became the second player in Florida State history to leave for the NBA after playing only one season at Florida State.